As competition for recruiting top talent continues to grow, more organizations are investing in their employer branding strategy to fully communicate the many benefits of what their companies have to offer. However, building employer brand awareness has its challenges, one of which is in building and maintaining a talent acquisition and marketing partnership. Many talent acquisition professionals who enlist the branding expertise of their marketing team find a willing and powerful ally, but others can also find their request for collaboration is lost in translation, where both teams are speaking in different languages. So how do you build the mindset required to establish a successful partnership with your marketing team in order to communicate a positive employer brand message? Talent Acquisition professionals tuned into our “Talent Acquisition + Marketing: Let’s (finally) Be Friends” webinar hosted by Lisa (Chartier) Colella, a leader in employer brand and recruitment marketing to learn the do’s and don’ts of talent acquisition and marketing collaboration. 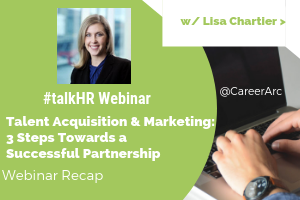 To help recap this latest CareerArc #talkHR webinar, we’ve highlighted three steps to take in order to build a strong relationship between both departments. 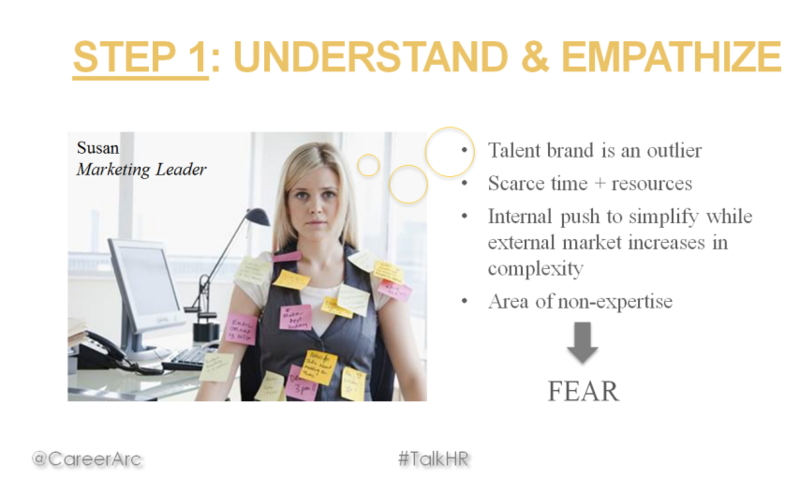 Webinar Poll: Who Owns the Employer Brand? Talent Acquisition or Marketing? It’s an ongoing debate, who owns the Talent Brand? Talent acquisition or marketing? Lisa kicked off the webinar by launching a poll asking attendees their thought on this frequently asked question. While 26% of attendees believed the human resources and talent acquisition department should own a company’s talent brand, a mere 10% believed marketing should be solely responsible. Nevertheless, over 60% of attendees presume human resources and marketing should team up to own their talent brand together. Unexpectedly, Lisa threw attendees a curveball mentioning it actually doesn’t matter who owns a company’s talent brand. It could be both or neither. She goes on to say that the talent you are trying to recruit doesn’t care who owns talent brand, they care about the experience they have with your brand. However, it does take a village to develop an employer brand and two of the key members in this village are talent acquisition and marketing teams. Lisa then dove into examples of how to achieve a successful partnership with your marketing team in order to develop an employer branding strategy that has buy-in from both teams. Every relationship is built on trust and understanding. Before making any requests, you first need to understand how your marketing team works and empathize with them. Marketing professionals are experts in corporate communications, developing social and event strategies, and creating brand awareness. However, note that for most marketers, developing a talent brand is often outside of their scope. On top of having limited time and resources, most marketing teams will view your initiative as an entirely new domain, and with anything unknown comes a level of anxiety and even fear. Lisa suggests creating an empathy map where you can outline, to your best ability, a marketing person’s daily tasks, job duties, pain points, and their overall goals within the organization. Having an understanding of your marketer’s workload and state of mind will help your partnership flourish. The second step towards achieving an effective partnership between talent acquisition and marketing is to get a jump start on your relationship, now. No need for a pressing project to prompt a connection. Lisa recommends checking their LinkedIn profile to see if you share any interests that can be used as a conversation starter. You can also invite them for coffee or lunch as a way to get to know them better, professionally and personally. If you would like to get a clearer understanding of what projects the marketing team is working on, ask if you can attend their open seminars or events. 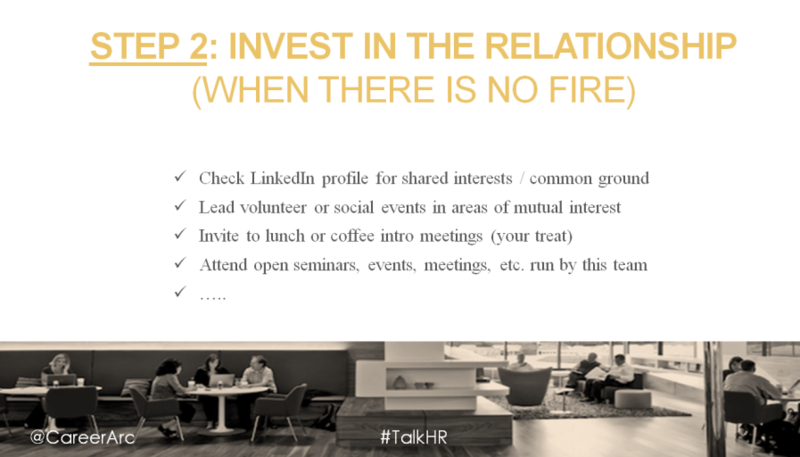 There are many opportunities to make a good first impression without waiting for the “right” project to attend, or fire to put out. Once you are ready to request help from marketing for your employer branding initiative or strategy, make sure you communicate your message effectively. 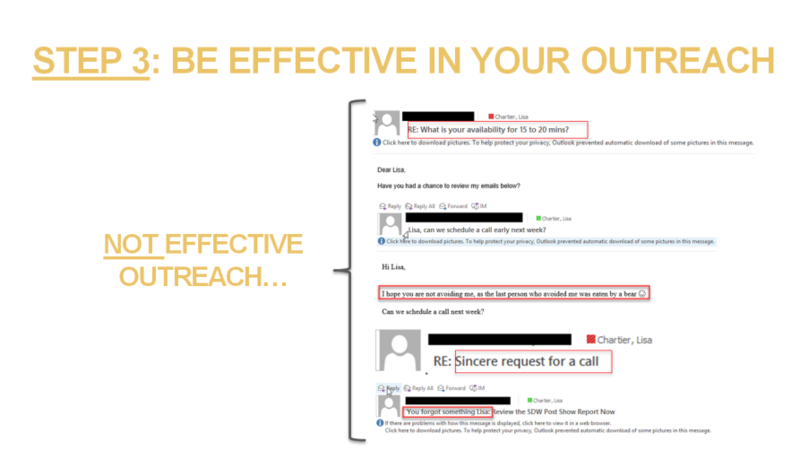 Lisa dove into a few examples of messages and subject lines to avoid when trying to connect with your marketing team. Don’t assume your marketing contact has 15 minutes to spare. Don’t send a message where you create an urgency where there isn’t one. Don’t appear desperate in your outreach. These styles of messages can give your recipient a bad impression and ultimately make them hesitant to work with you. Ready to get a jump start? Discover the must-know tactics & strategies for Linkedin, Facebook, & Twitter hiring. Watch our Social Recruiting 101 webinar now. 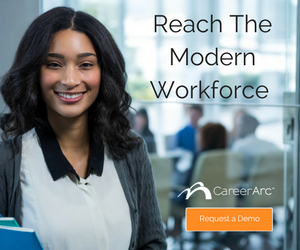 Learn how to build a successful partnership between your talent acquisition & marketing teams in order to communicate a positive employer brand message.